Lots of people drink coffee not quite as many, I reckon, are involved with cannabis on some level. So, how do they interact in us? Here is a fascinating study on just that subject. In a study of coffee consumption published in the Journal of Internal Medicine, Northwestern scientists were surprised to discover coffee changed many more metabolites in the blood than previously known. Metabolites are chemicals in the blood that change after we eat and drink or for a variety of other reasons. I love my morning coffee. I also love a cup of cappuccino after dinner when dining out, so, clearly I have a dog in this fight. Scientists have found that people who drink coffee appear to live longer. People who consumed a cup of coffee a day were 12 percent less likely to die compared to those who didn’t drink coffee. This association was even stronger for those who drank two to three cups a day—18 percent reduced chance of death. Drinking three to five cups a day linked to lower risk of arterial plaque. I enjoy coffee and have some every morning. I drink decaf because I don’t like to introduce unhealthy chemicals like caffeine into my system. That’s just me. 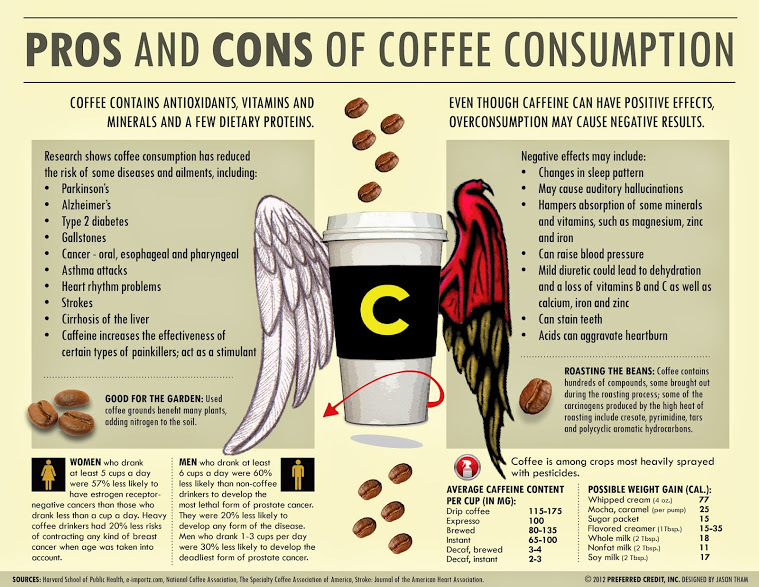 I am not trying to proselytize here, just get the facts down, because the latest from the Tufts Health Letter interested me as a coffee drinker and blogger who covers health. Thought you might be interested in this. Seems most of us have a beverage of choice first thing on arising. When I worked in the Reuter newsroom on Fleet Street, I was surprised that most of my British fellow journalists drank coffee while I, the resident Yank, was thrilled to discover English tea with milk in it. I am a coffee drinker and coffee lover. I wrote about my cold brewing coffee in March. Also, check out my post from Harvard on coffee facts. This is one of the most informative infographics I can remember seeing. Enjoy! The latest Harvard Health Letter offers some fascinating insights into our morning brew. “Coffee is part of many people’s daily routine, whether it’s the morning pick-me-up or the evening complement to a satisfying dinner. And it’s no wonder: a hot cup of brew is comforting and flavorful. Even better, new evidence continues to associate coffee with health benefits, such as a reduced risk of an early death, as we reported to you in February 2016. “Our understanding of coffee is evolving. We’re learning more about it all the time,” says Dr. Eric Rimm, a professor of epidemiology and nutrition at the Harvard T.H. Chan School of Public Health. First of all, bike riders are notorious coffee drinkers. Although I ride a bike plenty, I am not one of the caffeine crazies. However, I did just write a post on cold-brewed coffee. My daily consumption comes to little more than two cups a day. Draw your own conclusions. I just ran across this infographic and thought it had a lot of good information on the subject. Here’s a fun little caffeine fact: Caffeine was on the International Olympic Committee (IOC) list of prohibited substances for many years. Athletes who tested positive for more than 12 micrograms of caffeine per milliliter of urine could be banned from the Olympic Games. This level can be reached after drinking about 5 cups of coffee. However, the IOC REMOVED caffeine from the banned list in 2004. Caffeine was taken off of the list of banned substances so that athletes who drink cola or coffee are not penalized. There are a number of conversational ’third rails’ like, religion, politics, labor unions, etc., and I usually sidestep them. I wouldn’t be surprised if coffee is another. So, let me say up front, I am not trying to change anyone’s coffee drinking habits. I just wanted to tell you about my own. As regular readers know, I often back projects on the two crowdfunding sites, Kickstarter and Indiegogo like my Torch helmet and my HYDRA Smart Water Bottle, both for bike riding. Now I would like to tell you about BOD’s BodyBrew a new cold brewing coffee system that I backed. For the record, the extent of my ‘backing’ of this product was under $100 and my ‘reward’ limited to one of the coffee makers. I am not trying to sell you one and I get no royalties or further payments from BOD. That’s how crowdfunding works. So, what is cold brewed coffee? It is coffee brewed by substituting time for heat. In other words, you pour cold water over it and come back 12-24 hours later and you have a batch of coffee liquor with which to brew coffee. The nourishing gourmet says, “You leave coffee in water for 12 hours or more, and then you strain it. You now have a coffee concentrate that will last at least a week. What more can you ask for? “The advantages of cold brewing coffee, as I see it, are as follows. I am a coffee drinker in moderation, so I only worry about the effects of caffeine on me. I have heard horror stories of ‘caffeine headaches’ that die hard coffee drinkers get. So I pretty much limit myself to decaf. I was happy to learn the latest from Harvard on coffee drinking. People who drink about three to five cups of coffee a day may be less likely to die prematurely from some illnesses than those who don’t drink or drink less coffee, according to a new study by Harvard T.H. Chan School of Public Health researchers and colleagues. 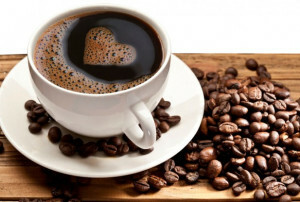 Drinkers of both caffeinated and decaffeinated coffee saw benefits, including a lower risk of death from cardiovascular disease, neurological diseases, type 2 diabetes, and suicide. I am a coffee drinker although it is limited to about a full cup each day. I know coffee drinkers usually put away a lot more than that. Nonetheless, I like my cuppa in the morning. Because it is so popular, I thought the following infographic on coffee drinking would interest you.